One of my favorite things about fall is simmering potpourri. I use potpourri throughout the year but the scents of fall and the holidays wafting through my home just really set the holiday mood. 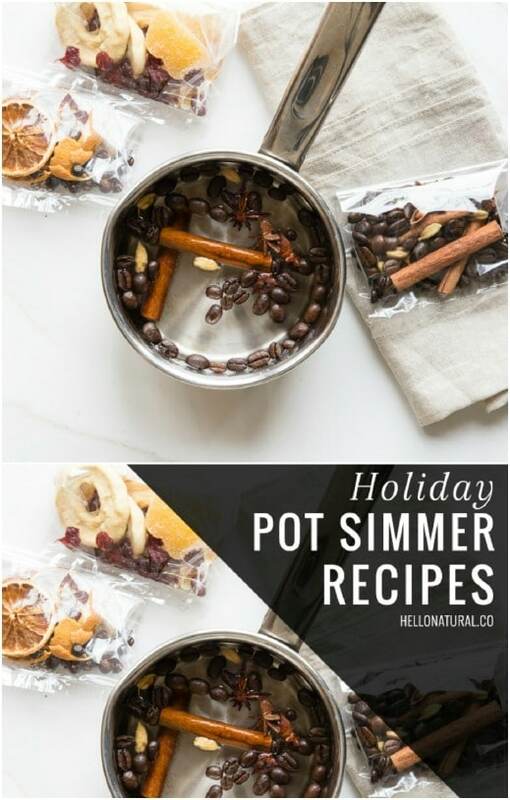 If you don’t simmer potpourri for the holidays, you should and I have found 18 wonderfully scented recipes to get you started. These range from smells of Christmas to just a clean fresh fragrance that you are going to love. They are all really easy to put together and are much less expensive than store bought sprays and candles. And, they fill your entire home with fragrance. Whether you enjoy the scent of cinnamon and orange for Christmas or you prefer cranberry, apple cider or something floral, you are going to find the perfect simmering potpourri recipe to fill your home with wonderful scents this holiday season. Homemade potpourri is really easy to make and can be done with things that you likely have on hand. And, you can upcycle things like orange peel and apple cores to make them. If you really love creating your own scents, you should be sure to check out these fabulous DIY scented oil mason jar candles. These room scents are wonderfully strong – not too strong – and they’re easy to simmer. You can do these in simmer pots or you can simply put them on the top of your stove and let them simmer in a regular pot. I love how easy they are and how wonderful they make your home smell. These are perfect to leave simmering throughout your family gatherings or just anytime you want the wonderful scent of the holidays to waft through your home. And, if you want to add to your festive décor, you can add a few of these 15 decorative candles and votives. You can make these for under a dollar. Lavender is a wonderfully clean and fresh scent and when you mix it with fresh rosemary and anise pods, you get a wonderful simmering potpourri that will fill your entire home with freshness. You also add lemon extract and water to this and just let is simmer on the stove or in a simmering pot. 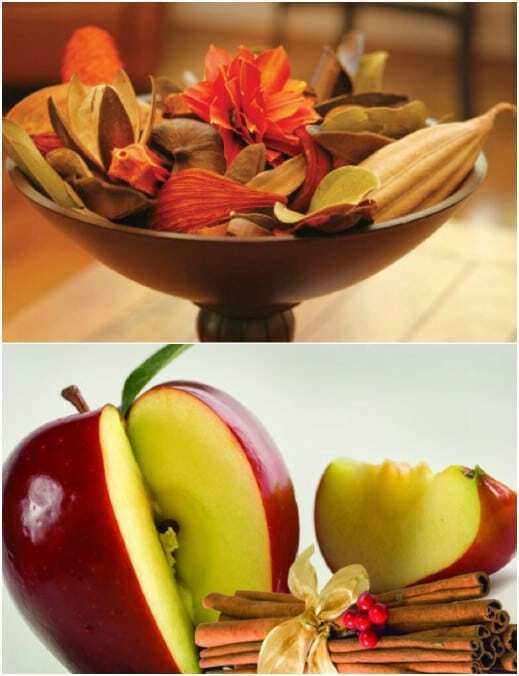 Apple spice is the perfect fall scent and this apple cider potpourri will fill your home with warm and inviting smells. To make this one, you need dried apples as well as cinnamon sticks, ginger and cloves. It smells like hot apple cider and you can make this one with the peelings and cores from your apples if you don’t want to use up the actual apple, like after you’ve made cinnamon apple rings. Just use what’s left after you slice up those apples. This simmering potpourri is made with bay leaves and anise so it smells like licorice. It’s perfect for adding wonderfully warm and inviting autumn scents to your home. You just add the bay leaves with cinnamon sticks, anise, ground cloves and orange peelings to a pot of water and simmer on the stove all day. Remember to keep an eye on the pot and add water whenever needed. 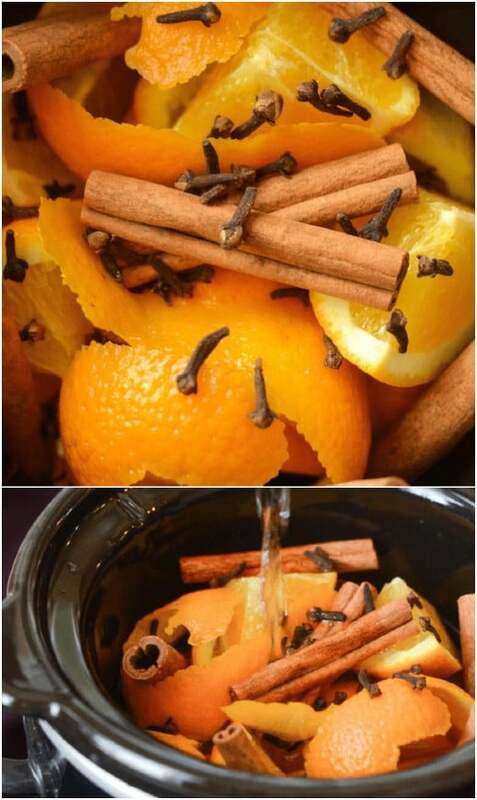 Orange peel, cinnamon sticks and cloves are the perfect scents for the holidays. This simmering potpourri recipe uses all three of those and you can make it in the slow cooker, so it’s super easy. You just add your orange peelings and other ingredients to the slow cooker and ad din water. 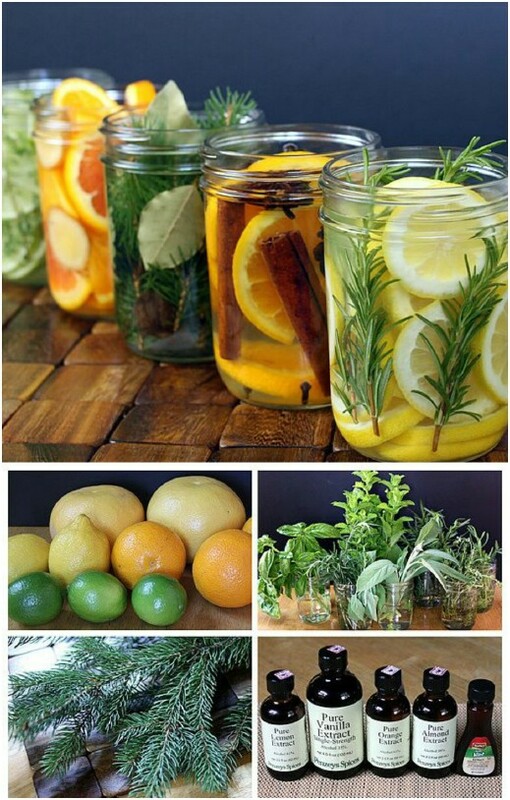 You can use any type of citrus you want for this one and change up the scent just a bit. This cranberry and cinnamon stove top potpourri definitely smells like the holidays. 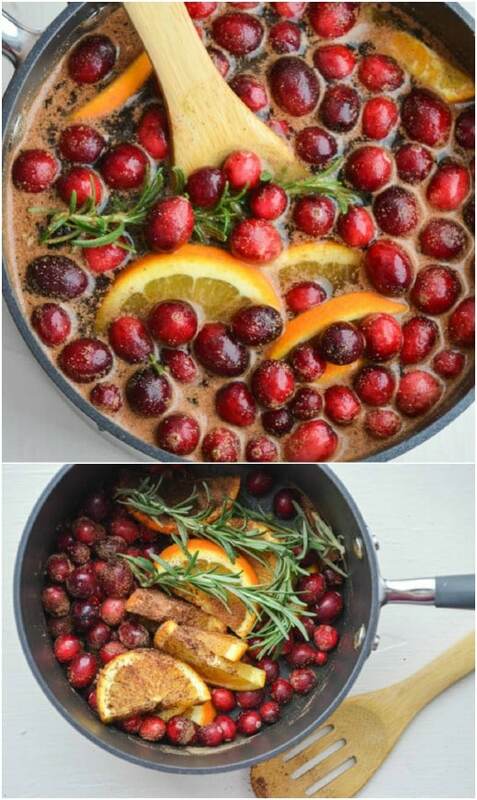 It has fresh or frozen cranberries, cinnamon sticks, oranges, cloves, nutmeg and rosemary and it smells absolutely amazing while it is simmering. If you want something to get your home ready for Thanksgiving and Christmas, this is definitely a scent that you need to try. Pine or cedar twigs are perfect for creating that great old fashioned holiday scent. 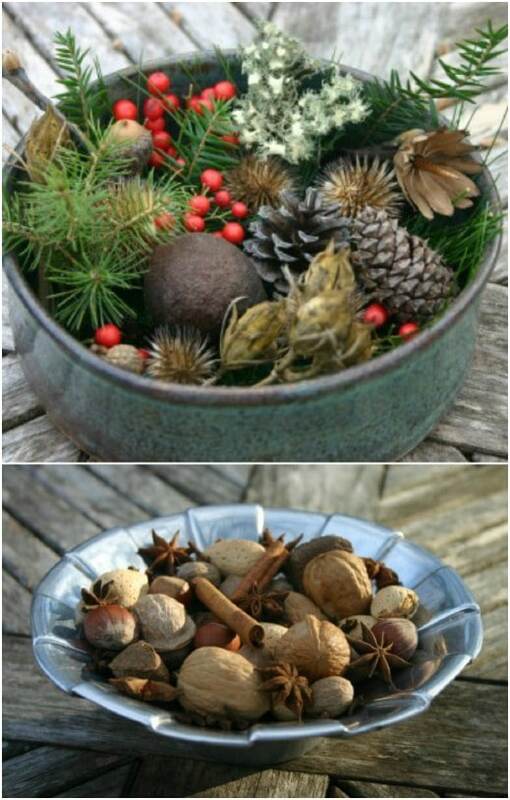 If you are looking to create a country style Christmas, this is the perfect simmering potpourri for you. You just add those twigs to a pot and put in bay leaves and nutmeg. You can also add cinnamon – I think cinnamon and pine work really well together for the holidays – or any other spice that you prefer. This would pair wonderfully with your DIY farmhouse style Christmas decorations. Anytime you get flowers you should save them. This goes for those wonderful spur of the moment surprise flowers from your significant other as well as those that you buy yourself. 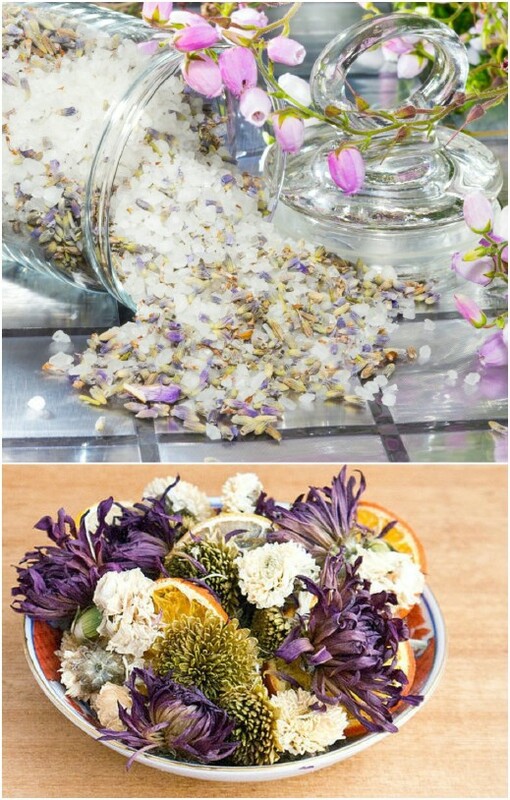 Once those flowers have dried out, you can use them to create wonderfully scented simmering potpourri and you don’t even need that many supplies to do so. Oranges are great for creating fall and winter scented potpourri and what you add to those oranges can completely change the scent. I love this fall scented simmering potpourri that has orange peel, cinnamon, cloves and vanilla bean to give it a warm and welcoming scent. The vanilla will make it smell like you’ve been baking all day and really set the mood for the holidays. What could possibly smell better than coffee? Honestly, I love the scent of coffee in the morning and this spiced coffee potpourri will smell like you’ve made a fresh pot…all day long. It has coffee beans (whole roasted coffee beans) as well as cinnamon sticks, whole cardamom pods, anise and allspice berries. This is honestly one of the best scents in the world, especially if you like coffee, and it has a wonderful odor covering property – in case you have pets, litter boxes, etc. 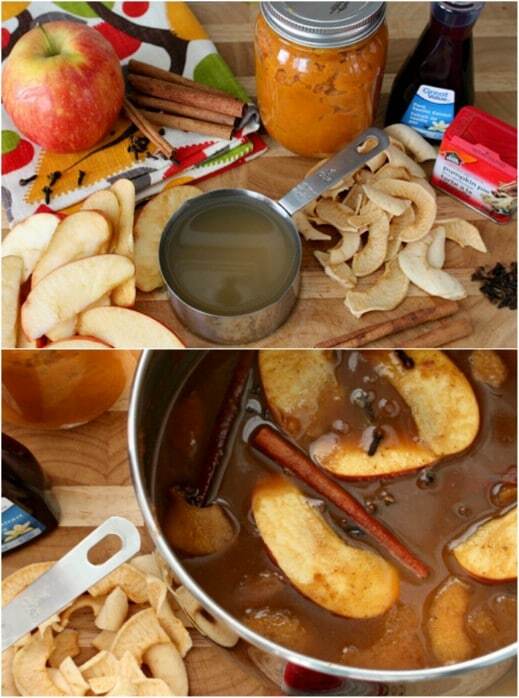 This potpourri has all the wonderful scents of the holidays in an easy to make and simmer recipe. You can add this potpourri spice mix to evergreen sprigs, pinecones and so many other wonderful natural holiday items. You can also use cloves, dried walnuts or hazelnuts, and a number of essential oils to make your holiday spice mix your very own. Just play around with scents until you get the one that you love. 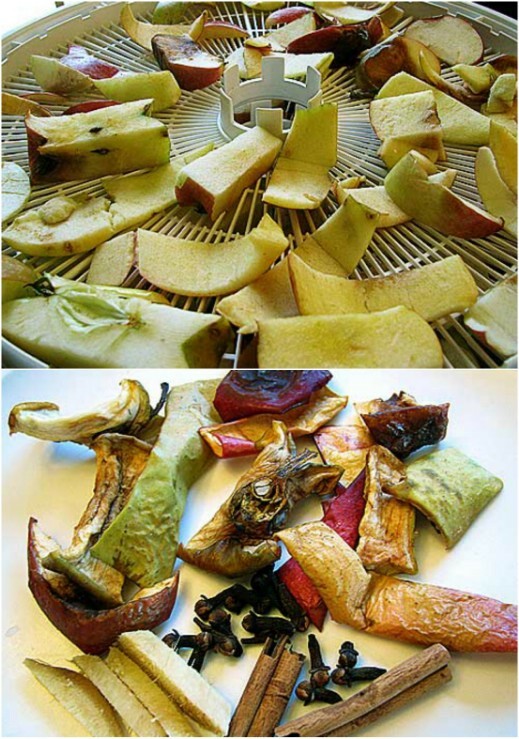 You can make the most amazing potpourri in your dehydrator. Once you have this dried out, you can leave it out dry or add it to a pot with water – or another scented liquid like apple juice or cider – and simmer it all day long. You just add whatever scents you like. Good ones for the holidays are apples, any citrus including lemons, oranges and grapefruits and then spices like ginger, cardamom, cloves or cinnamon. The good thing about autumn is that you have so many options when it comes to natural ingredients to add to your potpourri mix. Go outside and gather up pinecones, apples, walnuts and evergreen twigs. 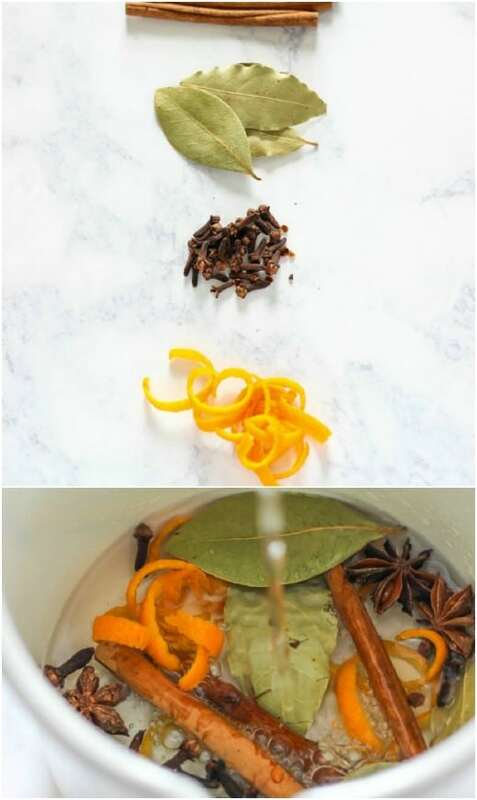 Then add those to nutmeg, cloves, orange peels, scented essential oils and dried flowers to create your own custom simmering potpourri scents. This stove top potpourri has so many wonderful smells of the holidays including oranges, cinnamon and pinecones. You start by dicing apples and then add pinecones, cinnamon, oranges, and rosemary to a pot of water to create this wonderful scent. 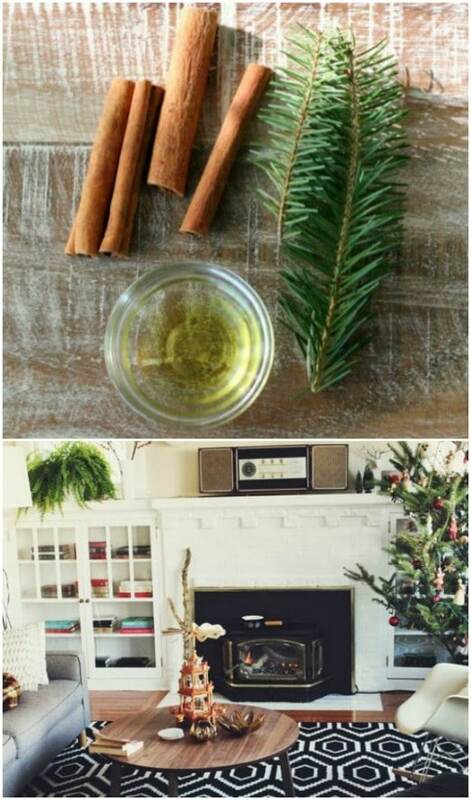 This is a great one for all winter and really makes your home smell warm and inviting. Plus, you can utilize pinecones. There are so many wonderful DIY pinecone crafts! I absolutely love the smell of cinnamon and pine. It has such a wonderful Christmas scent to it and you can get that scent by just adding a few pine sprigs to a pot of water and putting in some cinnamon sticks. If you have a fireplace, this is perfect for simmering in your living room or you can leave it on the stove top or use a simmering potpourri pot. 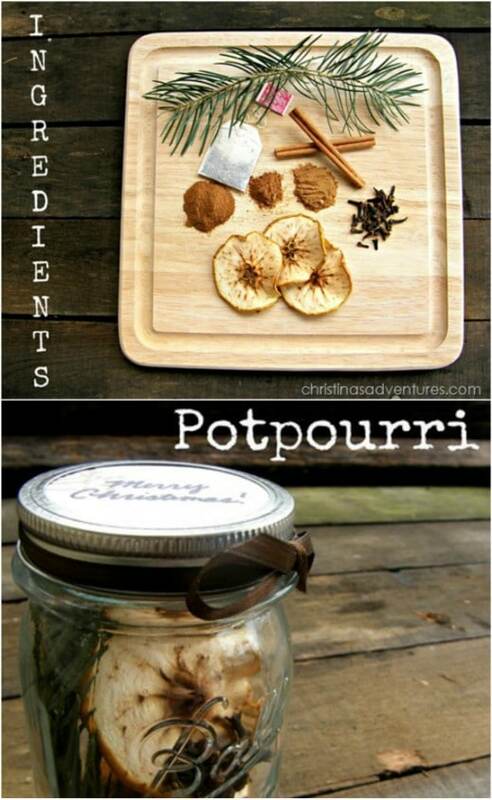 The scents really work well together and this is such a cheap DIY potpourri to make. Apples and pumpkin really are the scents of the season, aren’t they? 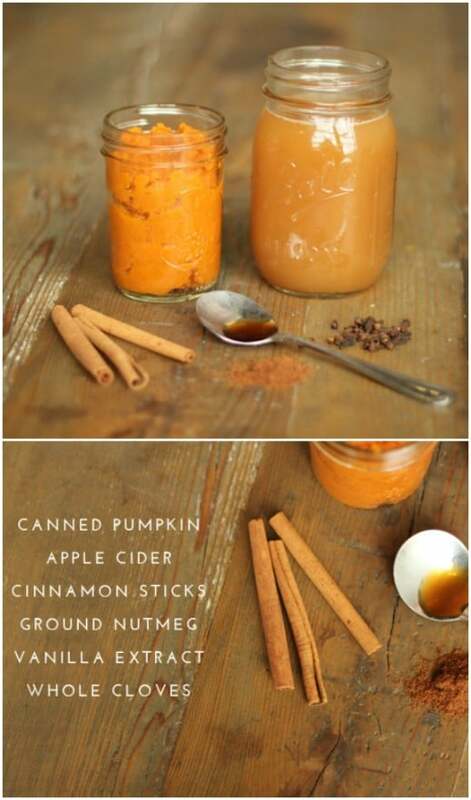 I love this recipe that has apple cider and canned pumpkin, along with cinnamon sticks, nutmeg, cloves and vanilla. It will smell like you’ve been baking wonderful holiday treats all day and you can simmer this for hours by just adding in a bit more water when it starts to get low. 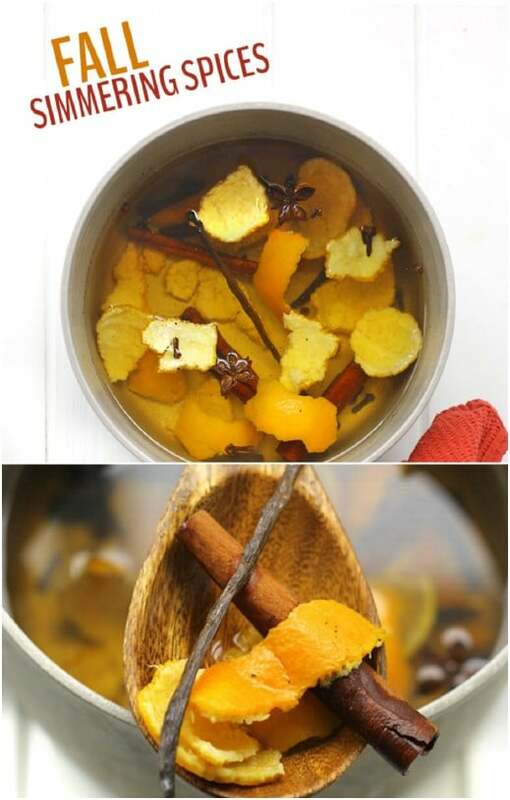 Here’s another wonderful simmering potpourri with pumpkin. This one has apple cider and canned pumpkin as well as apple slices – or peelings and core – and pumpkin pie spice to give it a really strong and wonderful scent. You just add all of your ingredients to a pot and simmer away. You can substitute the water in this one for apple juice or cider or use water if you want to cut down on the apple scent. 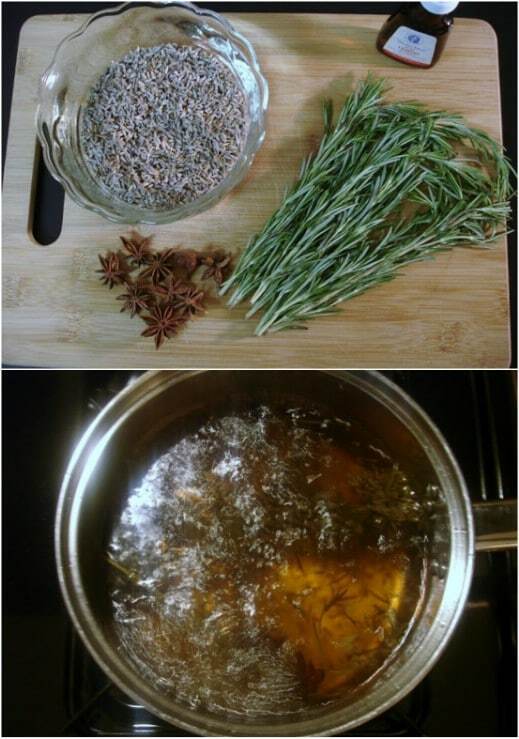 Herbal tea in any flavor that you want, adds to the wonderful scent of this holiday simmering potpourri. You just add an herbal tea bag to a pot that contains water, apple slices, cinnamon, nutmeg, pumpkin pie spice, cloves and a few pine branches. Peppermint tea would be wonderful in this if you are looking to add some holiday scents or you could use chamomile for a more relaxing scent. The choice is yours! 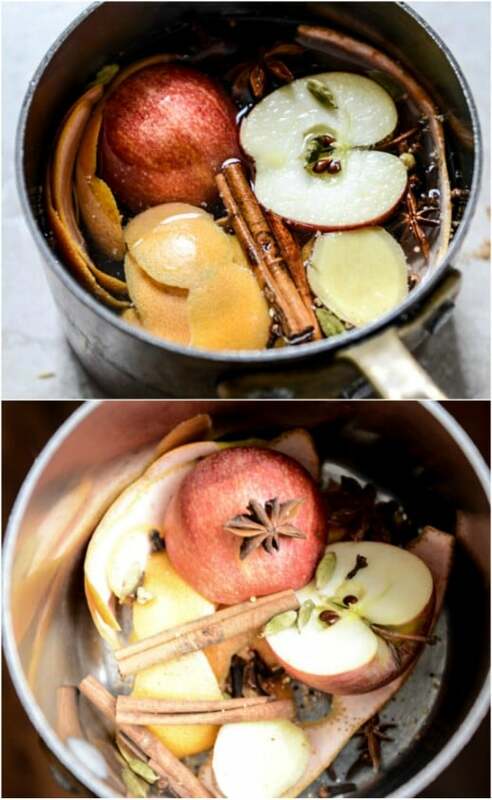 I love the smell of apples simmering and this apple and ginger potpourri is so perfect for fall. You can simmer this every day from now until New Year’s and it’s really easy to throw together. Just add apple halves – or you can use the cores and peelings if you’re making a pie – along with cloves, fresh ginger, cinnamon and a few other spices to get the most perfectly wonderful scent. Make this potpourri with the leftover apple cores and peels after you’ve made tasty apple pie fries. Picky, picky. Does it really make a difference in the recipe? I searched for the word “pine needles”, could not find it on the whole page but yours. Fill a loaf pan with water and your favorite recipe from above. Set in oven on high heat until it starts filling your home with lovely smells. Turn off oven, then prop the door open. Can I make this up and keep it in a jar until I’m ready to simmer it? I guess what I’m asking is can certain recipes be preserved?